Sick of the M&Ms, peanuts and raisins mix? 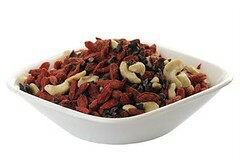 Try Navitas Naturals' Trail Power mixes for goji berries and cacao nibs. August 5, 2009, 7:09 p.m. I consider trail mix to be one of those snacks that, like fruit juice, people think of as healthier than warranted. We’re talking M&Ms, high-sugar dried fruit and high-fat nuts — which make for a nice speedy source of energy if one is, say, hiking, but which simply pack too heavy a sugar-and-fat punch — albeit with some healthy nutrients and/or “good fats” — for the regular, barely exercising American. This is why I got curious about Navitas Naturals’s Trail Power products — three new organic, raw trail mixes made with goji berries, cacao nibs, and other healthy real foods. The mixes — Goji-Golden Berry-Mulberry, Goji-Cacao Nibs-Cashew and Three Berry-Cacao Nibs-Cashew — are intended to de-”gorp” the now-commercialized typical trail mix, to take the portable food “back to its superfood roots” as invented by ancient nomads. So should you switch from gorp to Trail Power? Well, from a health stand point, Nativas Naturals products are quite impressive. You’ve likely already heard about the antioxidants in goji berries, protein and bioflavonoids in goldenberries, and the healthy goodness of cacao nibs. These Trail Power mixes bring those antioxidant superfoods together — and take out all the less healthy refined stuff (i.e. : M&Ms) too — for a not-to-sweet, energy-giving mix. But whether or not you like Trail Power will depend entirely on how you feel about goji berries and cacao nibs — two foods I’d love to like but always feel some misgivings about. Goji berries, IMHO, are sort of tasteless while you’re eating them, but leave you with a rather powerfully strange aftertaste once you’ve swallowed. As for cacao nibs — these healthy, unmeltable bits aren’t really offensive in and of themselves, but they really, really are not much like real chocolate. On the other hand, I did finish the 4-oz sample bags of Trail Power that Navitas sent me … I think gojis and cacao nibs are always going to be those foods that I keep giving another chance once in a while in the hopes my tastes will change. If you’ve always found trail mix too sweet and want a healthier snack for your next hike in Griffith Park, find Trail Power at a Whole Foods or other health-conscious store near you, or online at Amazon.